A Bank in the Ocean? Just north 50 miles north of San Francisco, CA, lies one of the richest marine habitats in the world. So special, it was nationally recognized in 1989 as a National Marine Sanctuary by the National Oceanic and Atmospheric Administration (NOAA). Cordell Bank National Marine Sanctuary is entirely away from the shoreline, only in offshore waters. 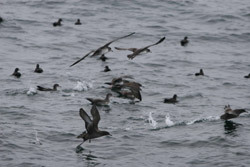 Throughout the year thousands of local and highly migratory seabirds, fishes, whales, and pinnipeds flock to these waters to feed in the food rich waters. Humpback and Blue whales swim from Costa Rica and Mexico in the summer and fall, Sooty Shearwaters fly all the up from New Zealand in the Southern Hemisphere to feed along the coast here, and Albatrosses fly from their breeding grounds in the Northwestern Hawaiian Islands to find food here for their chicks, then fly back to feed their chick! What makes this place so special is a combination of the contours of the seafloor and the oceanography that influences this region. In the spring and summer months, here cold nutrient rich waters are upwelled to the surface nourishing the complex food web that supports an abundance of marine life from tiny plankton to huge blue whales. The flow of water around these underwater features contributes to the extreme productivity of marine life. If you took away all the water and just looked at the seafloor, you'd be surprised to see that it is not flat! In fact it is very much like the land we see outside our windows. The flat and sloping continental shelf extends west for about 25 miles or so, then slopes to deep water. Cordell Bank rises up from this shelf, and reaches to within 115 feet below the surface of the water. The Bank is about 9 miles long by 4.5 miles wide and provides a rocky habitat for fishes and invertebrates (animals without backbones) to live. The upper parts of the Bank that are closest to sunlit and food rich waters are densely covered in colorful invertebrate life. Animals such as sponges, tunicates, anemones, stony corals like hydrocoral and orange cup coral thrive here and provide habitat for more mobile creatures like, giant-pacific octopus, seastars, crabs, and rockfish. Most people are shocked to learn that such a colorful "coral reef" like environment exists in these cold waters. Scientists at Cordell Bank National Marine use technology to learn about this dynamic, rough, remote marine environment. Satellites are used to study the sea surface temperature, chlorophyll from phytoplankton, wind currents, and surface currents. Remotely operated vehicles and submersible are used to see what lives below the surface. All the data collected contributes to our knowledge of this ecosystem and helps managers make decisions to help conserve this special place for generations to come. 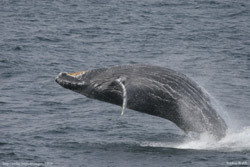 Dive in and learn all you can about your national marine sanctuaries at www.sanctuaries.noaa.gov.